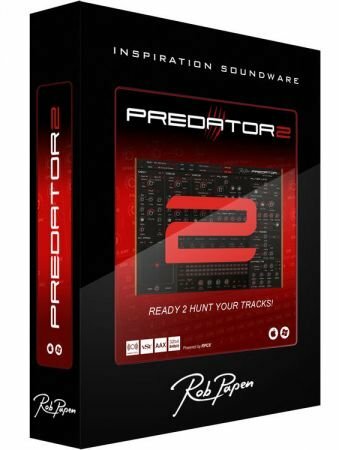 Predator 2 is the successor of a legendary synthesizer that has inspired many artists/composers and appears on countless music tracks! As before it combines inspiring presets and cutting edge features to make this your 'go-to' synth for contemporary music production. The user interface has again been designed so that almost all main controls are visible on screen, making it fun and incredibly easy-to-use. With Predator 2 and all its many cool features, we have also included an 'Easy Page' for the users that don't like too many controls. The 'Easy Page' offers you the most important parameters if you want to change a sound quickly or just want to use the handy 'preset variation' function, which is an intelligent randomizer. Predator 2 is packed with new powerful features such as: 'Waveform morphing', 'Waveform drawing', "WaveSet playmode', XY pad, new EQ, and new voice level distortion.... and so much more! Shipped with over 6000 inspirational presets, Predator 2 is a unique synthesizer concept which combines 'User Friendliness' and 'Packed Features' in one amazing product! - New screen selectors in the mid lower section. - New 'Big Screen' selector in the 'USER WAVES' screen and 'Normal View' selector. - Improved 'Bank Manager' lay out with more presets visual. "Osc 1 Phase", "Osc 2 Phase", "Osc 3 Phase". - With 'semi' as target. Changing amount of semi jumps (amount) in semi steps and if the 'shift' is used, that it can have values between semi values. - If the 'arp' is turned 'on' the XY jumps to 'free' mode. The reason for this, is that 'free mode' is the most logic mode if the ARP is turned on. - In free mode of LFO or XY, that is starts at zero if you hit play of the music program. This way if you start on the first beat, that timing is right. - Drag and drop. If you have open one of the modulation screens (XY, Envelope, LFO) that you can drag and drop from the upper part. - If the right mouse menu is used to address a modulation and it is done, this modulation page/sections opens in the lower mid section. So if you address something to the XY, that the XY page opens. - New userwave sets called: Dr.Who, Summer Waves, Mind Boggle, Wave Age, Live Stream.